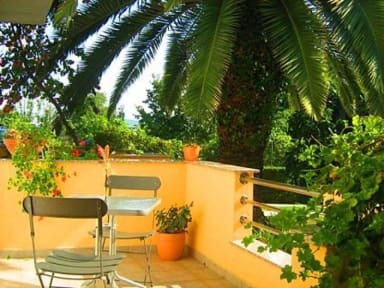 We offer four rooms with double bed with private bathroom and terrace or balcony with beautiful view of the nice garden. One room has a kitchen inside (STUDIO). Each room has third bed. Third bed cost 20 % cheaper. Our house is located on enter of the town from Airport Zadar, 10 minutes from nearest beach, 5 minutes from shop and 30 meter from the local bus station. We rent a bike for half price. 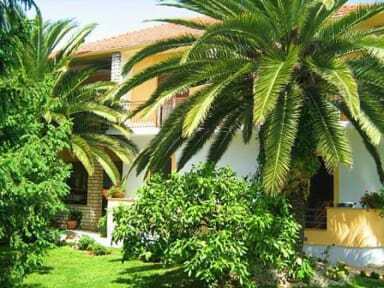 Beautiful house with lovely garden, every room has private access and private small terrace. Quiet and privacy. Everything you need was there, very clean, owner is very kind. Position is good travelling by car: easy to find, 10 min to old city, 3 min to shop. Around is industrial area but when you are in the house you feel really good. Il proprietario gentilissimo, ancorché fossimo rimasti solo una notte nella struttura, ci ha donato ottimi mandaranci, pompelmi e kumcats di sua produzione. La struttura è vicina al porto di Garzenica quindi comoda per imbarchi per le isole e non lontano dal centro storico della magnifica Zara. Very quiet place. Clean, small and cozy room, with conditionair and facilities like dishes, cuttlery and little fridge. We espacially loved the little terrace, a nice area with a little table where you can have a meal or chill out. The garden in front of the terrace is adorable. The host was kind and available forla any request. Vicino al nuovo porto. Zona desolata, ma posizione ottima per chi debba partire con auto più traghetto.